DONALD TRUMP’S NEW campaign CEO, Stephen Bannon has denied making anti-Semitic remarks in relation to his daughters’ schooling after accusations made by his ex-wife emerged. The revelation is contained in court papers reviewed by The Associated Press and comes a day after reports emerged that domestic violence charges were filed 20 years ago against him, following an altercation with his then-wife, Mary Louise Piccard. Bannon, the former head of Breitbart News, took the helm of Trump’s campaign last week in yet another leadership shake-up. The campaign has been plagued by negative stories about staffers, including charges lodged against his former campaign manager following an altercation with a reporter, and questions about his former campaign chairman’s links with Russian interests. Alexandra Preate, a spokeswoman for Bannon, last night denied that he made anti-Semitic remarks about the private school. “He never said that,” Preate said, adding that Bannon was proud to send his daughters to the school. Trump has previously been criticised for invoking anti-Semitic stereotypes, including tweeting out an anti-Hillary Clinton image that included a Star of David atop a pile of money. Clinton has tried in recent days to highlight Trump’s popularity with white nationalist and supremacist groups. The Republican candidate has noted that his daughter, Ivanka, would soon be giving birth to another Jewish child. Ivanka Trump converted to Orthodox Judaism when she married Jared Kushner, a young real estate developer who has become a driving force in his father-in-law’s campaign. The court filing was among several documents related to Bannon and Picard’s voluminous divorce case, filed in 1997, which was revisited several times as Piccard sought support for tuition and other expenses. The documents reviewed by the AP were part of a request for Bannon to pay $25,000 (€22, 329)in legal fees and to cover the $64,000(€57,163) in tuition it cost to send both girls to The Archer School for Girls for the 2007-08 school year. A police report obtained by The Associated Press said he grabbed her wrist and “grabbed at” her neck. When she tried to call 911, she told police that Bannon grabbed the phone and threw it across the room. An officer who responded reported seeing red marks on her wrist and neck. 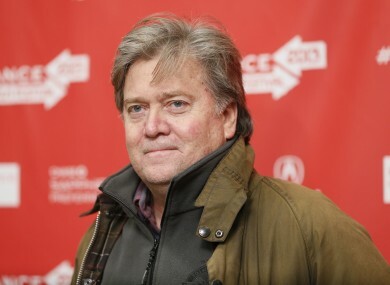 Bannon was charged in 1996 with misdemeanour witness intimidation, domestic violence with traumatic injury and battery, according to a Santa Monica, California, police report. The charges were dropped after his estranged wife didn’t show up at trial, according to court records. Piccard said in her declaration that she skipped the trial after Bannon and his lawyer arranged for her to leave town. She said Bannon had told her the lawyer would make her look like the guilty party if she testified and the attorney told her she’d be broke if Bannon went to jail. The Trump campaign declined to comment on the abuse charges. But Preate said police never interviewed Bannon. She added that Bannon has a great relationship with his ex-wife and kids. Email “Trump campaign chief denies anti-Semitic remarks about daughters' school ”. Feedback on “Trump campaign chief denies anti-Semitic remarks about daughters' school ”.